Field of Dreams, is one of my favorite movies because it taps into our deep yearning for wholeness. 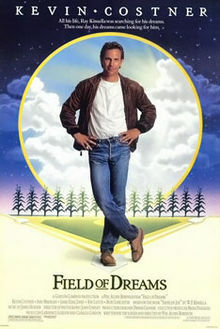 Ray (played by Kevin Costner) is compelled by a whisper-ish voice that inspires him to build a baseball stadium in a corn field in Iowa. The movie’s most enduring line is, If you build it, they will come. But the haunting refrain that pulses throughout it is, Ease his pain. Much happens between Ray’s first encounter and movie’s end, but the most touching scene comes when he is brought face to face with his father who had died years before. Their reunion and exchange close the movie. However just before engaging his dad he realizes that the voice that inspired the construction of the field was his own, and only a journey of pain and uncertainty would bring him to that point. So it is with us. The prospect of facing life uncensored and raw is terrifying because it is personal, but the gospel cuts through our layers of resistance to take us ‘there.’ Mysteriously, at one and the same time God enables us to face ourselves, and then live out of that reality without pretense, as He satisfies our God-given desire to be seen for who we are – and yet still be loved. I am reminded of Joshua’s commissioning, where Moses says, The Lord himself goes before you and will be with you; he will never leave you nor forsake you. Do not be afraid; do not be discouraged,” (Deuteronomy 31:8), asserting the promise and principle that there is no place God will ever lead us that He has not already been. It is ‘there’ that God heals our pain with Christ’s pain, our sorrows with Christ’s sorrows and our brokenness with Christ’s own death, demonstrating that He has already been ‘there’ on our behalf, and has completed our broken stories with His own. In short, He eases our pain. You are currently reading Going There at unfinished1.